Rates for airmail letters from Hawaii to the Middle East, Oceania, Australia and Asia reached by the Trans-Pacific Route were twenty cents less than the airmail rate from the mainland from May 23, 1939 until November 1, 1946. 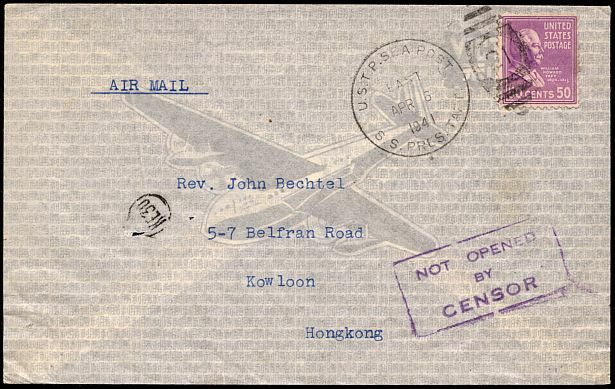 This cover was mailed from Hawaii to Hong Kong when the FAM rate from San Francisco was seventy cents per half ounce. It has been suggested that it is a contrivance, as Taft is on the stamp and it is postmarked from the S.S. President Taft, but it did pay the proper rate and was opened. Perhaps the combination was not coincidental, but there was a letter inside?